Who knew death could be so colorful? 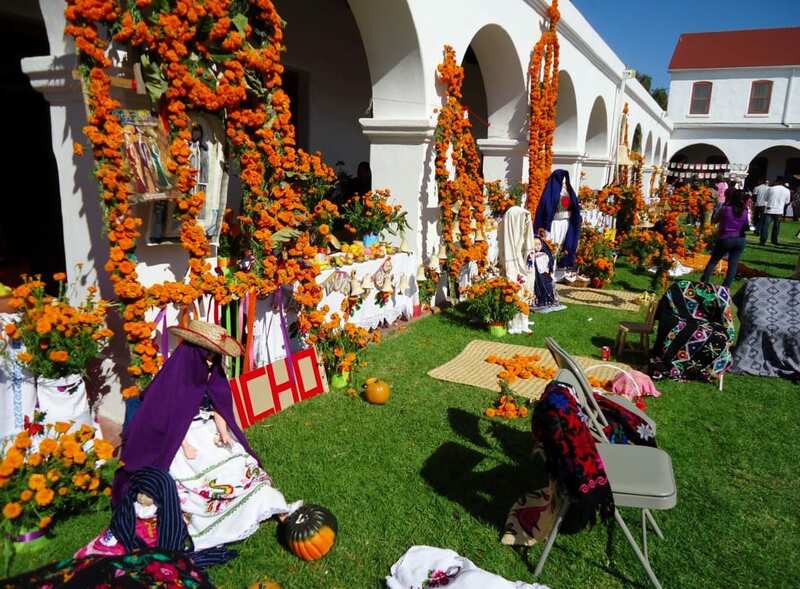 Purple and orange tissue paper banners line altars decorated with marigold petals, colorful sugar skulls, and a bounty of fruit and vegetables. 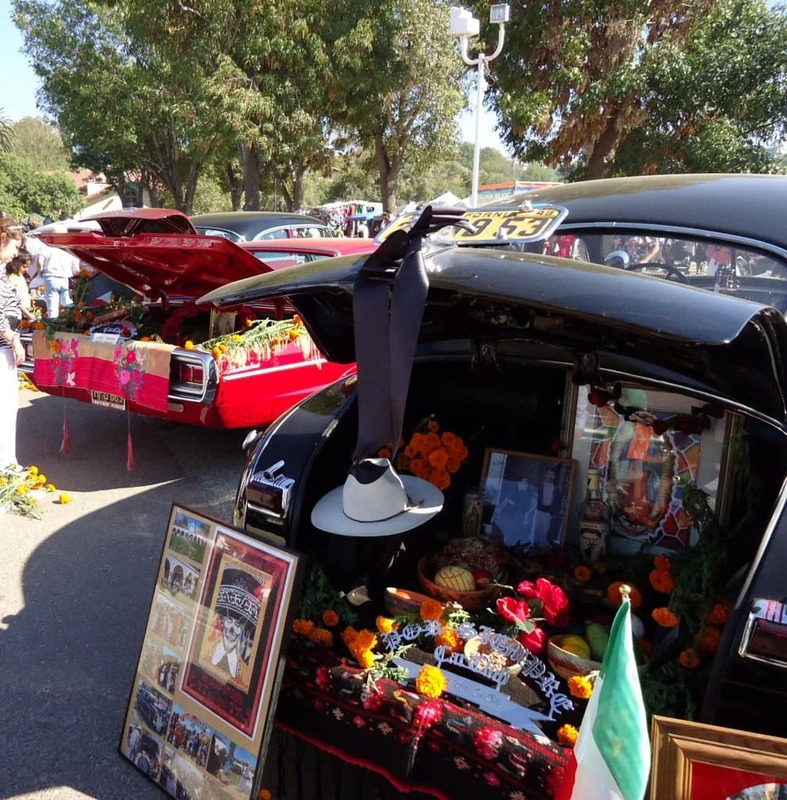 This is a celebration of life and triumph over death, the intermingling of the religious beliefs of the indigenous people of Mexico and the faith of the Spaniards that conquered them. 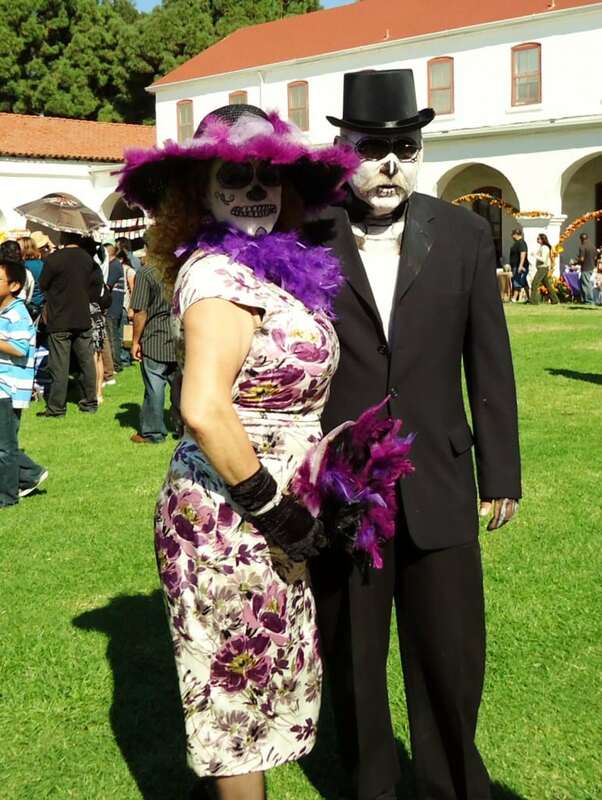 The Day of the Dead is not only a holiday that honors those who have left us, but it is believed that on that special day the souls of the dead return to visit the living. Both the indigenous people and the Church of the Spaniards believed that death was not an end, but only a passageway to another life. That is why this is a joyous occasion, a homecoming festival, and at the same time a way to mock death and the power it holds over our bodies. Before the arrival of the Spanish conquistadores, the Aztecs held rituals for the dead during the summer months in a joint celebration with the first days of harvest. 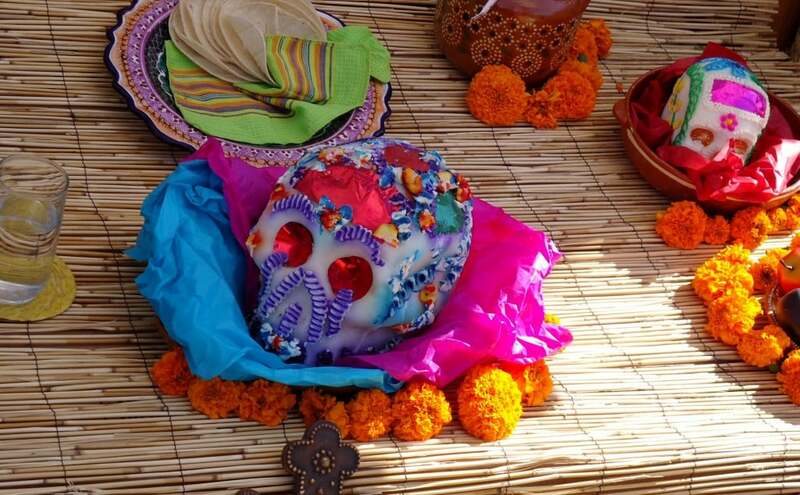 The dead were traditionally buried with rich offering of ceramics, personal objects, and food. The offerings where meant to assist them in their journey to the afterlife. After the arrival of the Catholic missionaries their traditions and beliefs were merged with those of the indigenous people, and the festivities were moved to coincide with All Saints Day and All Souls Day, Nov 1st and Nov 2nd. The festivities have evolved over the years and differ from region to region. 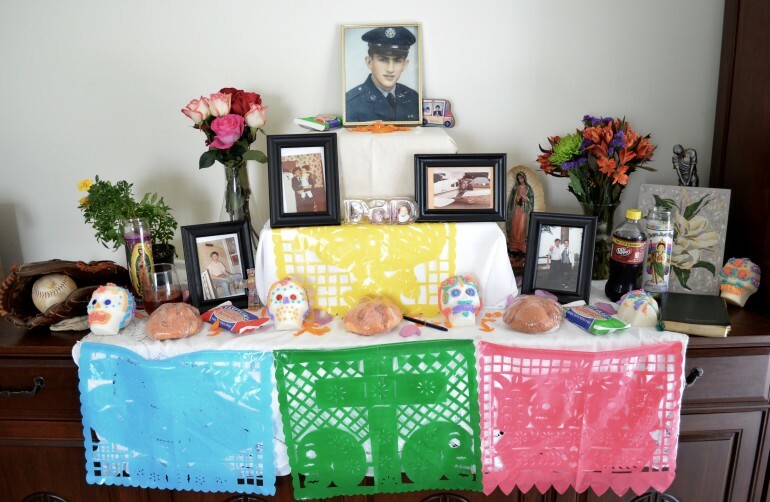 Some of the most popular ones include altars in honor of loved ones who have passed, preparing the dead’s favorite foods, and gathering at the cemetery to decorate a loved one’s grave, share a meal and reminiscence. 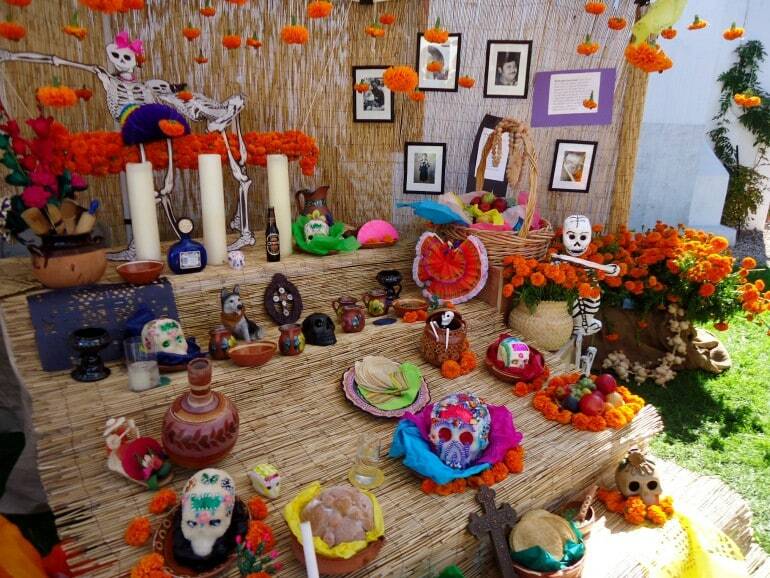 My favorite tradition is the elaboration of the altars. The symbolism incorporated into the altars is so rich and meaningful that it truly honors the dead, those we keep in our hearts, but somehow with the passing of time fade in our memories. a dog– to protect and guide the spirits. Every year we make an altar in our home to a loved one lost. 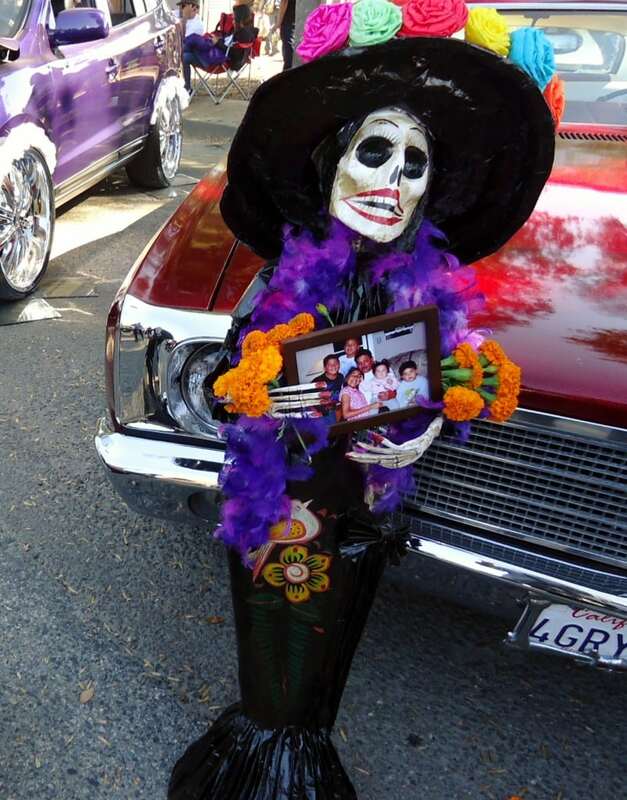 It is our own special way of introducing our deceased loved ones to our children. We talk about the things that they liked to eat, do, and why they are important to us. On November 2nd we say a prayer for them, and keep hoping for the day we will be reunited in the afterlife. For years now, we have also been attending the Day of the Dead Festival in Oceanside, CA. 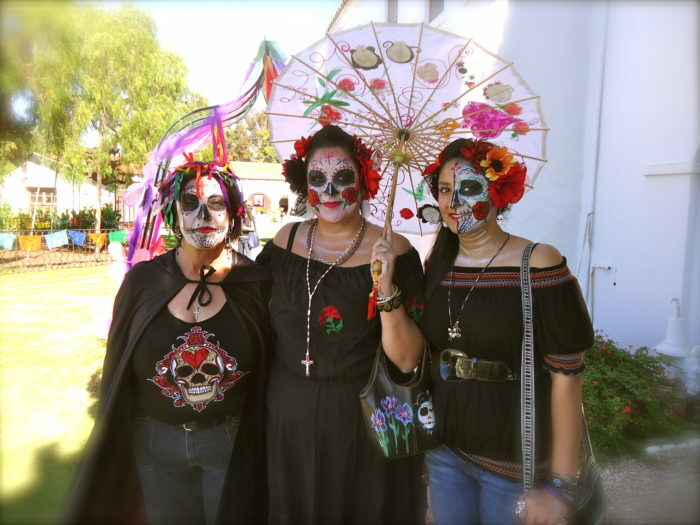 The festival takes place in the Mission San Luis Rey. 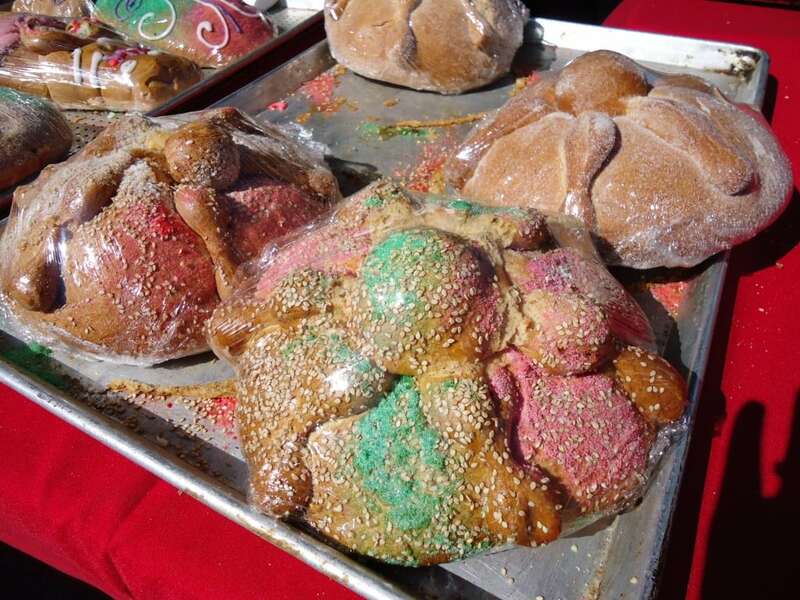 There are a variety of traditional foods such as tamales, tacos, tortas, aguas frescas, and pan de muerto. 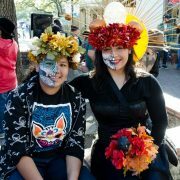 There is also face painting, sugar skull decorating, and regional dances. 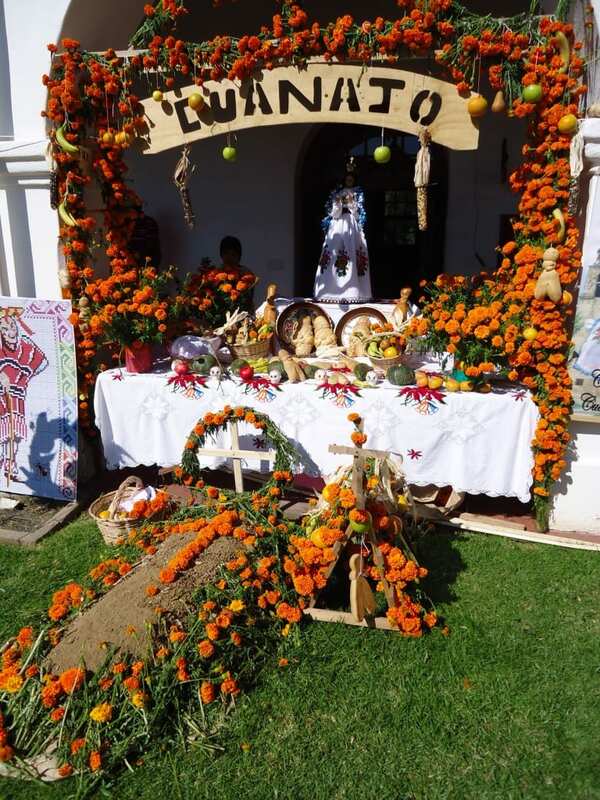 However, the highlight of the festival is the showcase of the altars, some representing various Mexican states and built by whole communities and families. 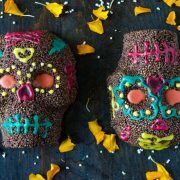 Out of all the wonderful Mexican traditions, the Day of the Dead might be the one that still holds firm to its pre-Hispanic roots. The loved ones lost, who we cannot see or hear, make themselves present in our homes, share our food, and partake in the rejoicing of life and the conquest of death. 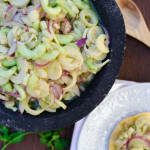 This recipe might be better than the non-vegan version, according to my husband. 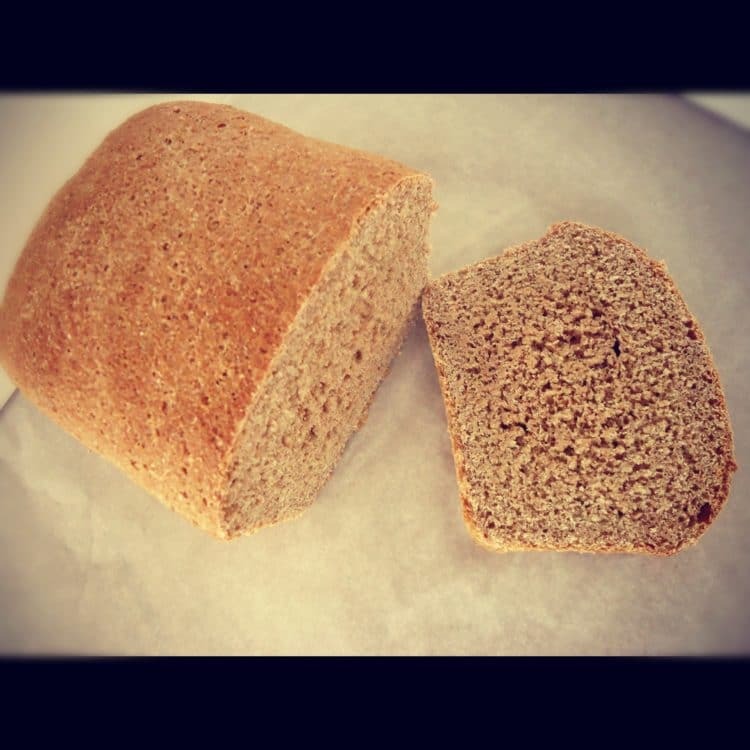 I have substituted the eggs with potatoes, resulting in a moist, soft, and sweet bread. 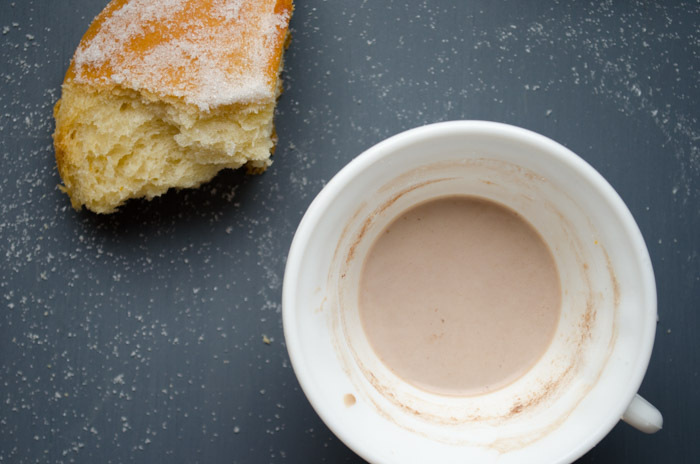 It is perfect for dipping in hot chocolate or coffee. Bake at 350F for 40- 45 minutes. 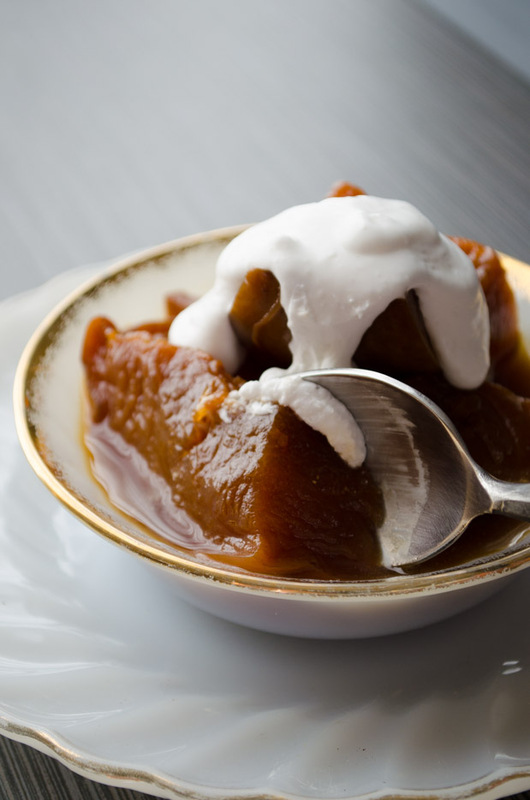 Brush with butter and sprinkle with sugar. 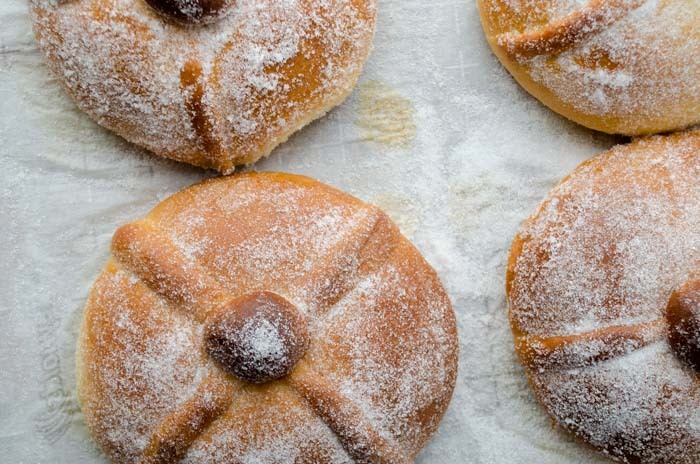 This vegan day of the dead bread or pan de muerto is tender, sweet, and delicious. 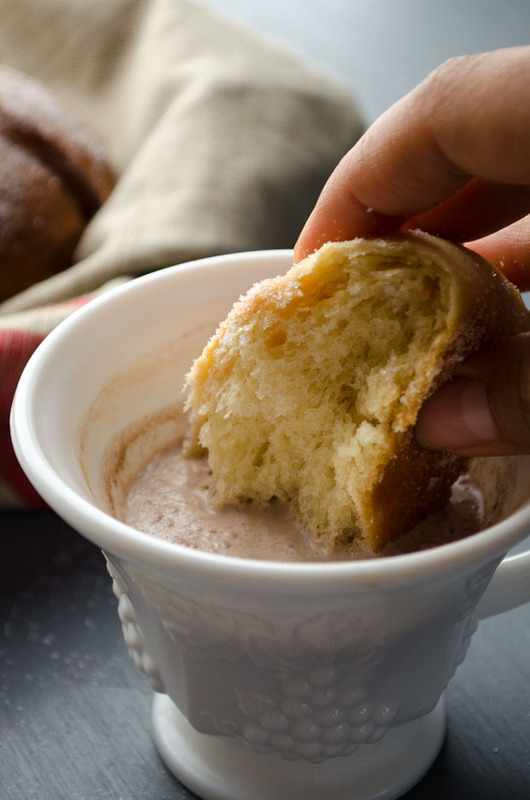 Perfect for dipping on hot chocolate. In a medium bowl, dissolve the yeast in the almond milk and add 2 tbsp. of the flour. 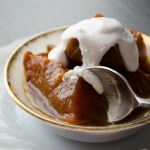 Whisk to incorporate and let rest in a warm place for 20 min. In the bowl of a mixer, with the dough hook, combine the dry ingredients: the rest of the flour, salt, sugar, and orange zest. Mix. Add the wet ingredients: the orange juice, mashed potato, and yeast-flour mixture. Mix on low until the dough begins to incorporate. Add the ½ cup + 1 tbsp. of softened butter little by little and increase speed to medium. Mix for 15 min. until the dough has come off the sides of the bowl and is stretchy but not sticky. Place the dough in a large oiled bowl, cover with a towel and let rise for 1 to 1 ½ hours, or until doubled in size. Punch down the dough and fold the side over unto each other and flip. Cover the bowl with plastic wrap and refrigerate overnight. The next day take the dough from the fridge, remove the plastic wrap and cover with a towel. Let rise in a warm place (70-75F) until the dough comes to room temperature, about an hour. Take a piece of dough, weighing about 3 oz., and set aside. Divide the remaining dough into four pieces. Roll them tightly into rounds and place on a sheet tray lined with parchment. Press down on the rounds lightly. Use the reserved dough to make 4 small balls the size of a quarter and set aside. Use the remaining dough to roll out eight strips long enough to cover the rounds. Place two strips on top of each round forming an x, use your fingers to press lightly on the strips to form knobs, they should resemble bones. Repeat the process with the rest of the rounds. Cover with a towel and let rise for 1 ½ hrs. in a warm place (70- 75F) or until double in size. Meanwhile preheat the oven to 350F. Place the small balls in the center of the rounds with a little bit of water. 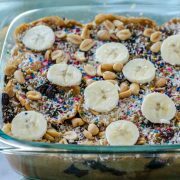 Bake for 20-30 min. until the rounds have become a rich brown color. 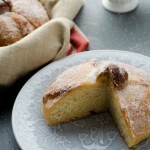 Cover with foil and bake for 10 to 15 min. more, until the bread reaches an internal temperature of 190F. Remove from the oven and let cool on a rack. While the bread is still warm melt 2 tbsp. of butter and brush the bread with it. Sprinkle evenly with sugar. Let bread completely cool before eating. My favorite vegan butter is Earth Balance. 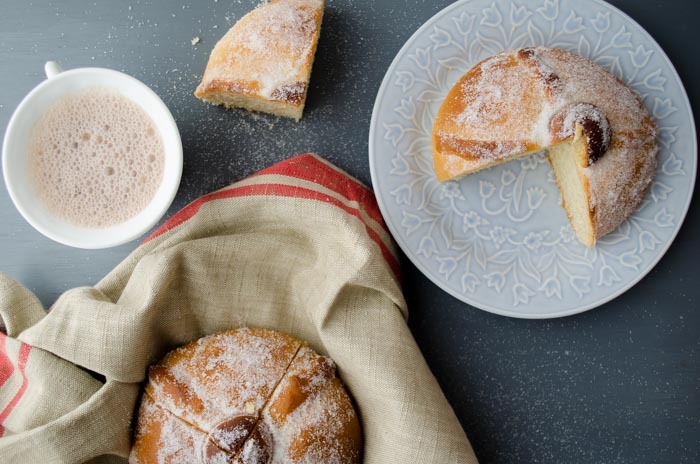 This recipe is a combination of my dad’s recipe and Fanny Gerson’s method for Pan de Muerto in My Sweet Mexico. 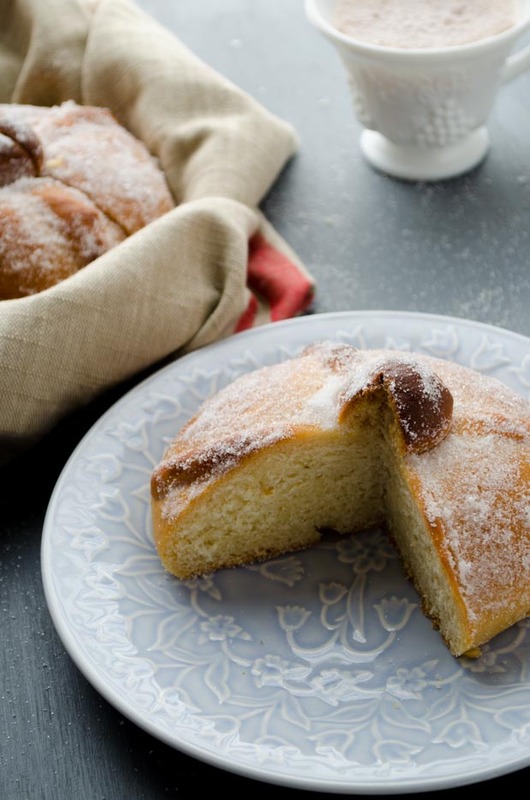 10/12/2015 /5 Comments/by Dora S.
I just love hearing about traditions and cultures. What a great way to talk about past friends and relatives with your children, and making a festival or a celebration of the day. Dora, this bread is just awesome! I’m currently enjoying a piece with some hot chocolate. I followed your directions exactly, and wouldn’t change a thing. I’m so glad you liked it and that the instructions were easy to follow!